Happy Valentine’s Day! 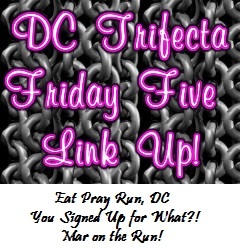 With most people focusing on love and other related ideas today, the DC Trifecta Bloggers (Courtney from Eat Pray Run DC, Mar from Mar on the Run, and Cynthia from You Signed Up For What?!) are centering this week’s Friday Five theme around love. I thought it would be fun to share my five favorite running songs with the word “love” in them. None of these are sappy love songs, but rather upbeat songs that keep me going while I’m running. QOTD: What is your favorite “love” running song? Great way to interpret the “Love” theme! Hmm i’d really have to think about this one! Now you have me thinking which songs I have on my playlist and I can’t come up with one that has love in it…haha! I love it as well! Its the song that my husband and I entered our wedding reception to. LOOOOVE this!!! And I’m downloading Say Hey RIGHT now! forgot about that song – so happy!! My husband and I love it so much that we chose that song as our wedding reception entrance song. Hmmm I just called to say I love you by Stevie Wonder. Another great choice, although not the easiest song to run to. Why is it always so hard for us runners to come up with good playlists? I often have trouble myself. I don’t know if I have a favorite song with “love” in it! That’s kind of sad! I’ll have to think about it! As silly as it sounds I love all these love songs 😉 Not sure about how good it would be to run to but I love ‘I had the time of my life’ from Dirty Dancing, sure they say love somewhere in that song! Nice list!! Always forget about Say Hey, love that song! Aaah this is great! Although to be honest I don’t run with music much… I know that makes me a bit of the odd one out!